The wild, untamed lands that lay north of Rivendell. It was here that the Witch-king fled after his defeat in the Battle of Fornost. 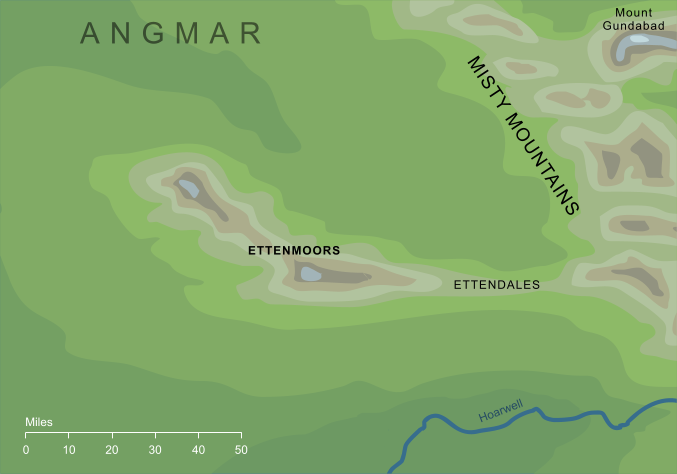 Eoten is related to the word ent, with the same meaning, and in fact early drafts of The Lord of the Rings refer to this region by names such as 'Entish Lands'. This apparent connection with the Ents, however, is purely a linguistic curiosity, and there is no suggestion that Treebeard or any of his kind ever strayed into this region. Though the word is usually translated 'giant', it had a more general sense describing any similarly monstrous being. Here it refers more specifically to the Trolls that infested these moors and gave them their alternative name of 'Troll-fells'. Original content © copyright Mark Fisher 1999, 2001, 2007, 2018. All rights reserved. For conditions of reuse, see the Site FAQ.